Only a single species is recognized in Hyaloteuthis. 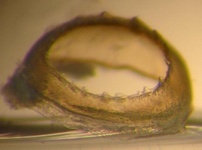 Hyaloteuthis pelagica is one of the smallest ommastrephid species reaching a mantle length of 90 mm (Nesis, 1982/87) and may mature earlier than any other ommastrephid (46 mm ML mm ML for females - Dunning, 1998). Its maximum size is approximately the same as the dwarf Todarodes pusillus. H. pelagica occurs in the upper 100 m at night but little is known about its daytime habitat although Young (1978) reported a mature female from 1,700-2,200 m captured in an opening-closing tow during the day off Hawaii. On one occasion, large numbers of mature H. pelagic were found stranded on a beach on Kauai, Hawaii (pers. comm.). Little is known of its general ecology. 19 large, round photophores on mantle. Hectocotylus may be on the right or left arm IV. Hectocotylus with 12-15 suckers of which the distal 2-4 abnormally small. Dorsal protective membrane, opposite last dorsal sucker, expands to form a flap then disappears; in same region, ventral membrane expands and thickens to arm tip without detectable trabeculae. Figure. Oral views of th hectocotylus of H. pelagica. Top - Entire hectocotylized arm, left arm IV, Hawaiian waters, 50 mm ML. Photograph aby R. Young. Bottom - Distal portion of the left arm IV showing the hectocotylized region. Drawing from Roeleveld (1988). Arms tips in subadults not unusually attenuate; arms I with 15-32 pairs of suckers (Wormuth, 1976). Arms I with dorsal and ventral membranes low, well below sucker level. Arms II with low dorsal membrane; ventral membrane reaches sucker level in proximal third of arm increasing to twice sucker level distally. Arms III with low dorsal membrane; ventral membrane two to three times height of sucker level, thin with prominent trabeculae. Arm suckers in rows 3-7 with weakly dentate proximal margins and distal 2/3 with 9-12 unequal, conical teeth with 6 larger teeth and small teeth inbetween; rows 8-15 with loss of proximal and inbetween teeth leaving 5-7 long, conical subequal teeth. Females with suckers of ventral suckers in rows 4-6 about 2-3 times larger in diameter than dorsal suckers on arms II and suckers on other arms. Figure. Oral view of arm suckers from H. pelagica, showing an enlarged arm II sucker. Drawings from Sasaki (1929). Figure. Oral view of large arm III suckers of H. pelagica, Hawaiian waters.Photograph by R. Young. Tentacular club with carpal locking-apparatus consisting of one knob and one smooth-ringed sucker (Wormuth, 1976). 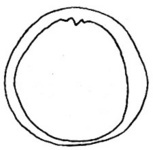 Largest club suckers with smooth ring but may have 1 large tooth (Roeleveld, 1988); largest suckers occasionally weakly dentate (Wormuth, 1976). Figure. 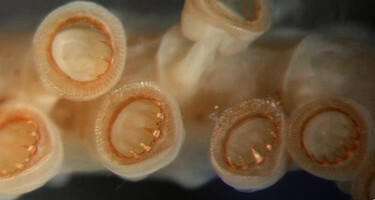 Oral view of the tentacular club of H. pelagica, mature female, 55 mm ML, Hawaiian waters. Note the rather elongate carpal locking-knob at the base of the club. Photograph by R. young. Figure. 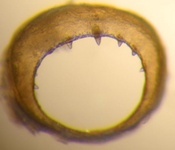 Largest club sucker ring from the median manus of H. pelagica. Left - Oral view. Drawing from Roeleveld (1988). Left center - Oral view, mature female, 55 mm ML, Hawaiian waters. Right center - Distal view, same sucker (composite photograph). Right - Proximal view, same sucker. Photographs by R. Young. Funnel groove with foveola and 0-2 side pockets (Wormuth, 1976). Figure. 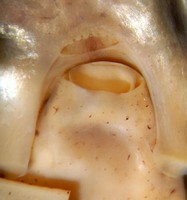 Ventral view of the funnel groove of H. pelagica, Hawaiian waters, showing foveola, side pockets not detectable. Photograph by R. young. Mantle component with anterior bifurcation less pronounced than in Ommastrephes. Funnel component without anterior bend. Figure. 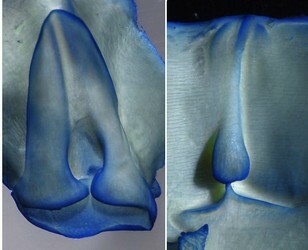 Frontal views of the funnel/mantle locking-apparatus of H. pelagica. Left - Funnel component. Right - Mantle component. Photographs by R. Young. Ventral surface of mantle with 19 round photophores. Figure. 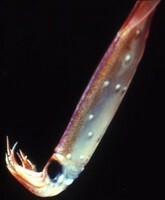 Ventral view of H. pelagica showing aberrant doubling at one photophore position (arrow). Photophore at posterior tip of mantle not obvious in this picture. Photograph by M. Vecchione. Two round photophores on ventral surface of head, one at base of each arm IV. Two spherical photophores in core of each arm IV located at 1/3 and 2/3 of arm length (difficult to see without dissection). Dorsal head chromatophores tend to be very small, especially those in the mid-dorsal line. Young paralarvae with few large mantle chromatophores, typically one dorsal and one ventral. Figure. Ventral and dorsal views of paralarval stages and the first juvenile stage of H. pelagica. Drawings from Harman and Young (1985). Figure. 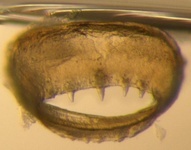 Frontal view of the suckers at the tip of the proboscis of a paralarval H. pelagica. Photograph from Harman and Young (1985). Fully developed hectocotylus may be present by 45 mm ML (Wormuth, 1976) and females can mature at least by 55 mm ML (pers. obs.). Type locality: Found within the stomach of a "dorade" in the open ocean. Atlantic and Pacific Oceans and probably the Indian Ocean (Nesis, 1982/87). Occurs in tropical waters to warm temperate waters in the Pacific (Wormuth, 1976). H. pelagica is an open-ocean species. Bower, et al. (1999) found that 35 % of H. pelagica paralarvae collected in Hawaiian waters were taken more than 200 km offshore and that paralarvae of H. pelagica belonged to an assemblage of oceanic cephalopod paralarvae rather than an Island-associated assemblage. Bower, J. R., M. P. Seki, R. E. Young, K. A. Bigelow, J. Hirota and P. Flament. 1999. Cephalopod paralarvae assemblages in Hawaiian Islands waters. Marine Ecology Progress Series, 185:203-212. Dunning, M. C. 1998. Zoogeography of arrow squids (Cephalopoda: Ommastrephidae) in the Coral and Tasman Seas, Southwest Pacific. Smithsonian Contributions to Zoology, No. 586: 435-453. Harman, R. F. and R. E. Young. 1985. 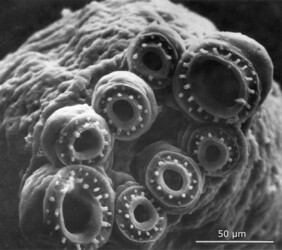 The larvae of ommastrephid squids (Cephalopoda, Teuthoidea) from Hawaiian waters. Vie Milieu, 35: 211-222. Wormuth, J. H. 1976. The biogeography and numerical taxonomy of the oegopsid squid family Ommastrephidae in th Pacific Ocean. Univ. Bull. Scripps Inst. Oceanogr. Univ Calif., 23: 1-90. Young, R. E. 1978. Vertical distribution and photosensitive vesicles of pelagic cephalopods from Hawaiian waters. Fish. Bull., 76: 583-615. Photographed from the Johnson-SeaLink submersible. Modified from: Sasaki, M. 1929. A Monograph of the Dibranchiate Cephalopods of the Japanese and Adjacent Waters. Journal of the College of Agriculture, Hokkaido Imperial University, 20(supplement):357 pages. Page: Tree of Life Hyaloteuthis Gray 1849. Hyaloteuthis pelagica (Bosc 1802). Authored by Richard E. Young and Michael Vecchione. The TEXT of this page is licensed under the Creative Commons Attribution-NonCommercial License - Version 3.0. Note that images and other media featured on this page are each governed by their own license, and they may or may not be available for reuse. Click on an image or a media link to access the media data window, which provides the relevant licensing information. For the general terms and conditions of ToL material reuse and redistribution, please see the Tree of Life Copyright Policies.